I discovered podcasts about a year ago. It was a life changer. Dishes aren’t nearly as dreadful to do when I can be entertained by a podcast at the same time! I also love to put one going on walks, car rides, anywhere really. Learn and do life at the same time?! Win-win. I used to say I would love to be a professional student (nerdy I know), but now I don’t have to, because there are so many podcasts, that you could learn almost anything you wanted to for FREE!! How awesome is that?! Ah. So good. I started with Tony, and once I started, I binged and listened to every podcast he has in like 2 weeks. I haven’t done that with a single other podcast to date. The reason I love it so much is because it’s a podcast filled with many different subjects with guests of all kinds. It’s super inspirational too, well, that’s what Tony does. I learned about everything from business to emotional health to leading and beyond. So you probably have heard of Bulletproof Coffee, well Dave invented that. He also created the Bulletproof diet as well, which is a keto diet. His message is that you can feel great and have tons of energy if you eat the right foods as well as supplement where you cannot get the enough vitamins from food. He is a bio-hacker, always trying new and “crazy” things to see if it will make him feel and perform better. It’s all about health and for me, I love knowing why I should do something, even if I don’t always implement these things into my own life. Okay, ladies. SO GOOD!! Honestly. I just got introduced to this podcast last week and I have listened to probably 20 episodes. You’ve probably heard of the new book, “Girl, Wash Your Face”, right? (If you haven’t read it-go get it now.) This podcast is from the author of that book, Rachel Hollis. And if you read the book and loved it, this podcast is for you. If you don’t know who Rachel Hollis is, she is a mom of 4, who talks about everything from business to raising kids to marriage…and much much more. For me, she is super relate-able and open which I love. Go check this one out ASAP! This one is for all of you entrepreneurs out there. I have learned so much about marketing and running a small business from Jenna, it’s unbelievable! Sometimes, I can’t believe it’s free! SO much good content here from how to succeed on Instagram and Pinterest, to how to treat your customers, to why you should have an email list. I have started doing many things for my company from advice given straight from this podcast. Jenna is awesome, also down to earth, and she lives in Duluth! I think it’s awesome that she is in the midwest. Can you tell I like to be inspired? This podcast is just how it sounds. 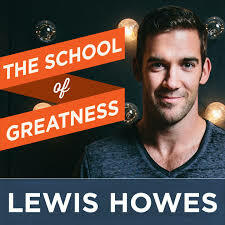 Lewis interviews awesome people, who inspire and have interesting backgrounds and stories. He was actually on The Rise Podcast and was really inspiring there, and that’s how I got connected with his. Totally worth the listen! This one is a bonus for two reasons. 1. I couldn’t leave it out. 2. I’ve only listened to one episode, but I loved it. So Rachel Hollis, from The Rise Podcast, is together with her husband here for a couples podcast! I love it for all of the reasons that I love the Rise Podcast. I’ve tried other podcasts about marriage and honestly, the couples bicker, or you can tell they are annoyed at times. But, I’m hoping I will love this as much as I’ve loved her podcast.